green, energy efficient, affordable housing options. GEH is committed to building healthy, stronger neighborhoods by providing green, energy efficient affordable housing options. We're committed to affordable housing and supportive services that transform neighborhoods and stabilize lives. Through collaborative partnerships we're focusing on holistic approaches in our communities. One of our best DOE Zero Energy Ready Home champions, Jean Brown, called a few weeks back needing help with a speech. 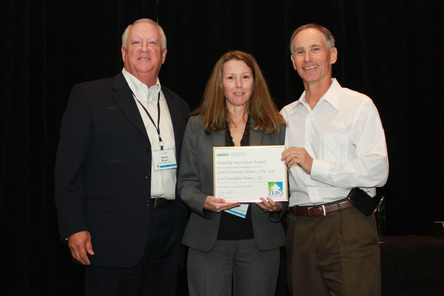 She and her husband, Steve Brown, had recently completed the first DOE Zero Energy Ready Home retrofit project in Garland, Texas. Now she was speaking at a charity event for affordable housing with an impressive array of dignitaries. She wanted a hard hitting message that spoke to her passion for the low-income households in need. In minutes I got back to her with the following short introductory message. I share it with you because I hope it also helps you with words that effectively speak to the power of zero. Imagine the home of the future. That’s why we’re proud to be bringing DOE Zero Energy Ready Homes to low-income families here in Garland, Texas. Your success as a builder of Zero Energy Ready Homes is critical to the overall success of this program. We can set high standards and you can build incredible homes, but getting consumers to understand and appreciate the value of a ZER home is what will define success for us as a program and you as a builder. That’s why DOE developed a Point-of-Sale Fact Sheet that shows with compelling clarity the added value for consumers to purchase ZER homes compared to ENERGY STAR Certified Homes and a typical existing home. The Point-of-Sale Fact Sheet, located under marketing materials in your partner profile, is now automatically customized for your business! If you already have a logo uploaded onto your profile, then your fact sheet is ready to go with your image and information. If you do not yet have a logo, you can upload one onto your account and it will appear in your public facing partner profile as well as the customized fact sheet and customized marketing brochure. Show YOUR customers the difference YOUR homes make! At ZERH, we are working on another tool to assist you in reaching your customers and successfully marketing your ZER homes. This showcase of ZER homes from across the country to take a look inside these special homes through pictures and infographics. The Tour of Zero showcases the empirical performance difference of a ZER home including actual data from ultra-low utility bills, testimonials from homeowners, statistics, lists of features, and floor plans, all of which illustrate why these homes liver better, work better, and last better. As we develop this tour, we may need more information from you, so please start talking to your current customers and collecting those utility bills. Big Thanks for Making a Difference! On October 23rd-24th, the ZERH program held its 2nd Production Builder Roundtable Meeting in Suwanee, GA. The purpose was to provide top executives from leading builders with a forum to share business and technical lessons learned, identify a list of common challenges delivering DOE ZERHs, and identify new solutions to bring back to their individual businesses. Over this day-and-a-half-long meeting, there was a remarkable, sustained level of energy and collaboration with active discussion. A full copy of the report from this meeting which highlights the key results will be available on the ZERH homepage soon. The names of the ZERH partners who participated are listed below. Additionally, a huge thank you goes out to Mitsubishi for hosting and sponsoring such an amazing event! DOE Zero Energy Ready Home program has created an exciting new opportunity for lenders to participate and to help recognize the value of innovative technologies and systems used by forward-thinking builders. Builders always tell us that the lending and appraisal process is still a challenge to financing energy efficient and innovative homes. Lender Partners who join the program agree to use available green appraisers and to facilitate the hand-off of the Appraisal Institute's Residential Green and Energy Efficient Addendum for certified homes printed out with HERS software to the appraiser. If you have a preferred lender, why not ask them to sign up today? Description: Net-Zero Energy properties have unique, high-performance features that should be prominently presented during the listing and sales process. However, these features also present challenges for appraisers and lenders: Lenders are challenged to find appraisers with competency and competent appraisers are challenged with limited Net-Zero Energy sales data. This webinar will reveal solutions on how to overcome these hurdles and how to market these homes. The 2015 Race to Zero Student Design Competition Top Winners to be Constructed! An amazing development has just been announced for the second U.S. Department of Energy (DOE) Race to Zero Student Design Competition. This year, the top two teams will see their work come to life. Zero Energy Ready Homes Partner, Carl Franklin Homes, will be constructing the homes designed by both the winner and the runner-up of the competition. This is an exciting opportunity for college students to have their work built; there is no greater reward. Once again, DOE is engaging college students across the United States and Canada to vie for the best market-ready zero energy ready home designs. Register your team by December 15, 2015, to participate in the second annual competition, which will be held on April 18-20, 2015, at the National Renewable Energy Laboratory in Golden, Colorado. And, view the 2014 result. November Nine for 90 Service Project - Honoring our Veterans from United Way Dallas on Vimeo. The Energy Department presented Housing Innovation Awards to 28 industry leaders from across the nation during the Energy and Environmental Building Alliance’s Excellence in Building Conference in St. Louis, Missouri. The industry leaders are commercializing and deploying cutting-edge technologies and helping to significantly reduce the energy costs of the nation’s homes. "The Housing Innovation Awards recognize forward-thinking contractors and builders for delivering extraordinary energy efficiency while ensuring superior comfort, health and durability in new and existing homes," said Dr. David Danielson, Assistant Secretary for Energy Efficiency and Renewable Energy. Builder Green Extreme Homes, is a winner in the Affordable Building category. GEH has been awarded the Department of Energy (DOE) Zero Energy Ready Home Housing Innovation Award for 2014 in the Affordable Category. DOE considers this a significant accomplishment because our leadership is paving the way for the rest of the U.S. housing industry to provide zero energy ready homes that are better for our communities and our nation. 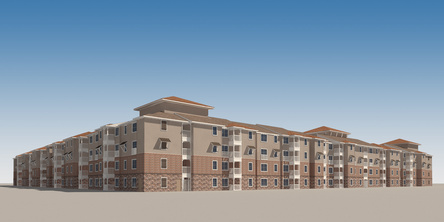 Plano City Council passes a resolution supporting 300 units of affordable Senior housing! 60 of these units will be set aside for Veterans, and 30 for persons with physical disabilities. Groundbreaking begins in November - stay tuned for details. GEH will open a waiting list later this year! The goal is to end Veteran homelessness by 2015. Jean showcased Green Extreme's partnerships with nonprofits and for profit companies and how the community coming together is changing the lives of Veterans and their families. Coalition building is paramount. Jean chairs the housing committee for the Veterans Coalition of North Central Texas. VCNCT has over 70 members with the majority being nonprofits and Veteran Service Organizations. Handing Over the Keys Ceremony to the Hinson family, both disabled veterans with two children. City of Garland and GEH partnered to build a SIPS constructed home as a test case. Home is currently under construction and will be monitored by the City comparing a new traditionally built home - stay tuned for energy savings! In partnership with Rebuilding Together Greater Dallas, another Veteran Family gets a rehabbed home.